This is a non-refundable deposit. The balance will be due by April 5, 2019. Click here for the registration form and more details. Please print, read, fill out, sign and return to us at 9537 Taylorsville Rd., Louisville, KY 40299. Registration will not be considered complete until we receive this signed form. Once we receive the registration, we will send you the waiver, supply list, etc. If you have any questions, please call us at 502-261-7377. PLEASE NOTE: Shipping charges will show up on your receipt, but you will NOT actually be charged the shipping fee, but only the $200. 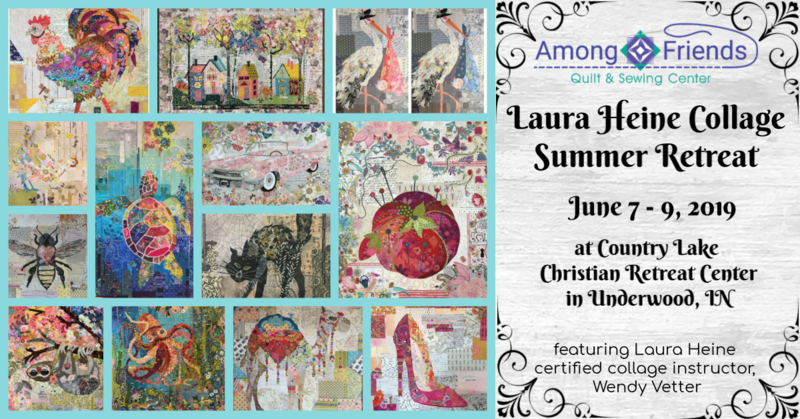 Join Among Friends at the Country Lake Christian Retreat Center in Underwood, IN, on June 7 – 9, 2019, featuring a three-day workshop with Laura Heine Certified Instructor, Wendy Vetter. You will learn the Laura Heine way to do fabric collage as you make one of her projects. Choose from 14 different Laura Heine patterns. Wendy will show you Laura's tips and tricks to make these awesome art quilts. There is fun and freedom in fabric collage, and anyone can do this no matter what your skill level. Constructing the quilt top is no-sew, so you do not need to bring a sewing machine to the retreat. We will have three days of collage, activities, food and fun! Retreat price is $ 599 (double occupancy). There are a few single rooms available for $ 725. Country Lake Christian Retreat Center is a 30-minute drive from Downtown Louisville.